I absolutely love artichokes. In the past I’ve simply steamed the artichokes whole and then removed the undesired parts as I ate it. Since we are coming up on summer I wanted to play around with grilling artichokes.I didn’t want to grill them whole because I’m sure it would take forever. I found this great video from Gourmet Magazine on how to trim artichokes. 1/2 to 1 artichoke per person. 1. Simply trim the artichokes as shown on the video (linked above) then cut them in half. 2. Steam the artichokes for 10-15 minutes. Remove from pan and rinse in cold water to stop the cooking process then pat them dry. 3. Drizzle the artichokes with olive oil, salt, & pepper. 4. 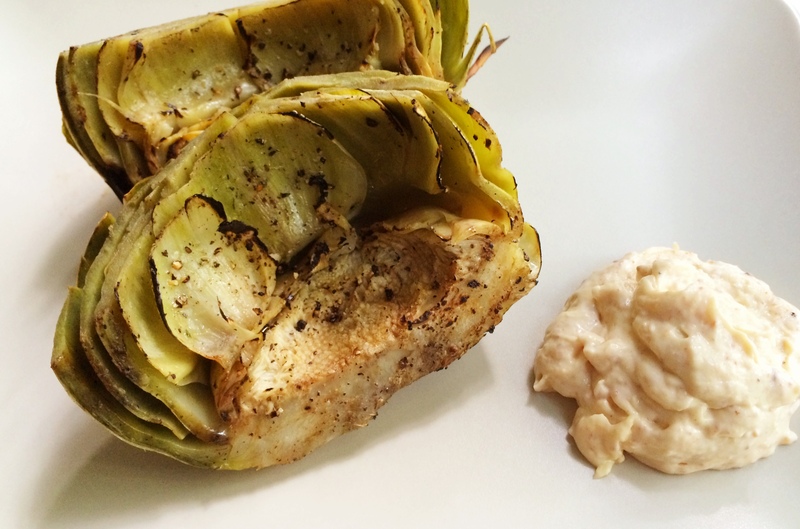 Grill the artichokes on heated grill for 3-5 minutes each side to char slightly. 5. Serve them with aioli. great tips! can’t wait to try this!